Stops leaks in hydraulic systems and increases hydraulic pressure. Stop initial wear and increase fluid life in new hydraulic systems. Renews hydraulic fluid with an additives that not only stop seal leaks, but reduces operating temperatures and boosts pressure, but also extends the life of hoses and cylinders. For dump trucks, fork lifts, construction equipment, etc. 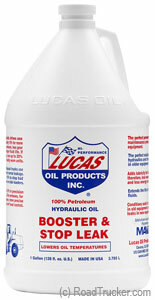 - use approximately 5% to 10% for preventative maintenance and maximum performance in newer equipment. Use up to 20% to correct heat, leaks and fading in older equipment.